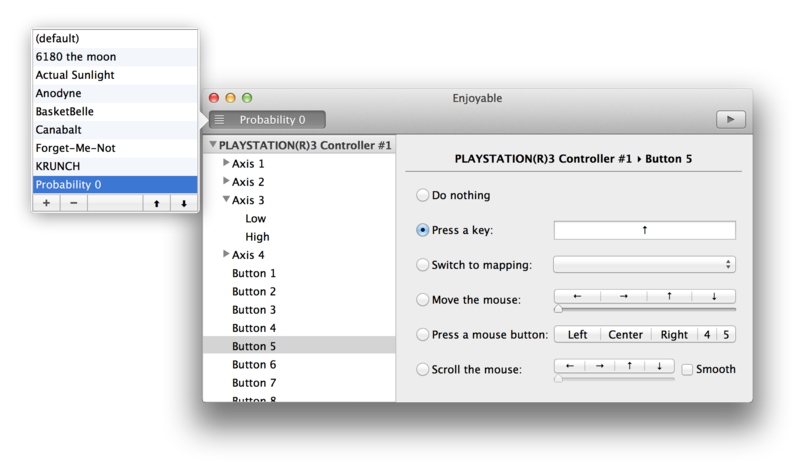 Use your gamepad or joystick like a mouse and keyboard on Mac OS X.
I play games with a Playstation 3 controller, so these will be useless if you have a different controller. These are the mappings I use for games I like. To use them, just save them and double-click on them in Finder, or use ⌘O in Enjoyable to import them. Enjoyable is free software written by Joe Wreschnig and is based on the Enjoy codebase written by Yifeng Huang and Sam McCall.